Child-friendly?This Disney movie features talking guinea pigs who have been trained with secret agent skills. Though the film is produced by Jerry Bruckheimer of Transformers, it is specifically geared toward children. However, some younger audience members may get frightened from the live-action 3D technology incorporated into the film. While Disney has had 3D movies before, this is the first that isn’t animated. With its PG rating, the film is probably appropriate for children aged 5 and up. Disney has released its first live-action 3D film and it has appropriately used the idea of talking guinea pigs trained with James-Bond skills as its plot device. While talking animals are always a popular Disney choice, parents should be aware that this film is in 3D, which means some scenes may be scary for younger children. The plot involves a scientist (played by comedian Zach Galifianakis who leaves his Hangover film persona at home) who has trained the pigs thanks to a Homeland Security grant. However, when it appears his funding may be taken away, he unleashes his test subjects to take out billionaire Leonard Saber (Bill Nighy) who has a plan to destroy the world with household appliances. 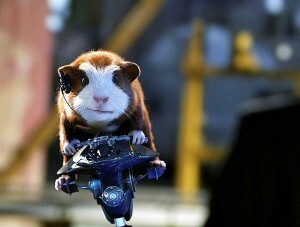 Unfortunately for G-Force, the name of the elite team of crime-fighting guinea pigs, their mission is shut down by the U.S. government, forcing the animals to be "sentenced" to a pet shop. This brings more talking animals into the film. Part of the draw of the film may also be the high-profile actors voicing the main characters: Sam Rockwell, Penelope Cruz, Tracy Morgan and Nicolas Cage. The humor is fairly innocent and mainly centered on some of the animals passing gas. There is some mention of the social networking site Facebook, which may be something parents should be ready to answer questions about.